Hello, My name is Robyn. I am a yelling Mom and this is my story. There, I said it. It is an awful truth of my life. And when I say yelling, I don't mean everyday discipline, and using your stern "Mom voice". We all need a good Mom voice! I mean the yelling to where my throat hurt after only a few minutes. The worst thing about this truth is I know the pain of being yelled AT by your mother, yet I have allowed the cycle to repeat when my kids were very young. 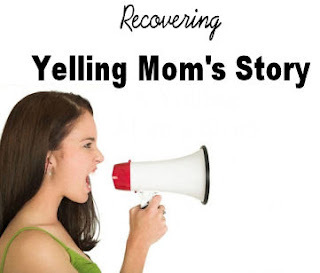 I do have the joy of being able to say I am a Recovering Yelling Mom. The reason I use the term "recovering yelling mom" instead of saying I no longer yell, is to remind myself that I do still have the capability to loose it (Can you tell I have family in AA?). Now how do I do it, you ask? There are several things that help. When I am any of these, I have greater chance of yelling. Self awareness is one the biggest key to being a journey to yelling recovery. But I still fail. The LONGEST LASTING way I have found out of continuous yelling is to embrace Conviction. A quick way to discern if you are feeling condemnation/shame or conviction is: where does it make you run? Conviction makes you run towards God for cleansing and change through repentance. "Mommy Guilt" is a common term in our modern world of parenting, and I know it is a way our enemy wants to keep us from growing, or seeking help. I tried for a long time to make myself 'good enough' before I would come to Jesus with my yelling. How could I look for help from mentor Moms when I could not even be honest with them about my problem? That is exactly what our Enemy wants, he wants you to live in the darkness, to stay away from Jesus. He especially wants you to stay away from the support system of your fellow sisters in Christ. He want you to think you are the only one. Listen to me, you are never the only one. We must not hide sin or we allow it to become a wedge between us and our Savior. Shame is about keeping sin in the darkness. Jesus is the light, and he brings the light even to our most shameful places. (John 1:4-5, 1 John 5-9), Shame. is. not. of. Christ. PERIOD. Unfortunately I have let the enemy drive that wedge of shame between me and my Savior too many times to count. I am very acquainted with shame. If you are feeling "MOMMY GUILT" that manifests as shame and the urge to hide your yelling from your husband, or anyone else, renounce is as a the lie it is. No growth or change will be found in the dark. Remember your Savior Jesus is light, and His light on our weaknesses it a gift! Wordly sorrow is shame that make you hide your yelling. Worldy Sorrow is Mommy guilt. Worldy Sorrow is shame and is a tool of Satan. Wordly Sorrow is embarrassment that keeps you from being vulnerable with those who have walked down the same path. Godly sorry leads to the light. Godly sorrow leads to vulnerability and new found intimacy. Godly sorrow leads to the joy of forgiveness. Godly sorrow leads to lasting change! Wordly Sorry makes excuses, Godly Sorry takes responsibility. No one can make me yell, only I can make me yell. When we make excuses about our family of origin, our disobedient children, or our personality (and yes, I have used all of these), we are not truly feeling Godly Sorrow. Shame and excuses are strongholds of Satan, chaining you to the repeated sin patterns because you are too embarrassed to ask for help. Repentance leads to freedom to change those patterns that have harassed you in the dark alleys of shame. It is liberating because it frees from our old cycles of sin, we don't have to be that person anymore! Honesty with yourself in the moment that you are about to lose it. Honesty with your kids that it is wrong for Mom to yell at them. Honesty with your husband when you feel like you are burning out and need a break. Honesty with your God, that you need him to change you. When I was willing to feel the Godly grief that led to prayer, I was able to truly discern where the yelling comes from, how to discern when I am close to my breaking point, and forgiveness that truly keeps me from repeating it. 1. Embracing His Conviction means embracing Forgiveness. I have experienced the true joy when I ask my kids for forgiveness for my yelling, and receive it quickly. I have also had the freeing moment of unconditional forgiveness from my heaven;y Father. I will NEVER be too needy for God. God will never say "Nope, you have already asked me to stop your anger 5 times today, I have better things to do ....and you are too needy,get a hobby." He welcomes my need, tells me to run to Him when I need Him. Embrace that, embrace the freedom of conviction because it makes us RUN TO GOD to fill our need. C.S. Lewis says 'The Christian does not think God will love us because we are good, but that God will make us good because He loves us.' Jesus didn't die for me because I was good enough, He died for me because HE was good enough. God can break the stronghold of yelling, AND the stronghold of Shame, in your life. RUN TO HIM. I promise you that from a fellow recovering Yelling Mom. "But if we walk in the light, as he is in the light, we have fellowship with one another, and the blood of Jesus, his Son, purifies us from all sin.